New requirements are contained within the NFPA 652 2019 Edition that place more responsibility on the owner/operator of a facility and the Authority Having Jurisdiction (AHJ). Particularly, the owner/operator is now responsible for determining whether the materials being processed or generated in their facility are combustible or explosible. 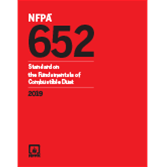 If the materials are combustible or explosible, then a Dust Hazard Analysis (DHA) shall be completed in accordance with the guidelines of NPFA 652 Chapter 7. The purpose of the DHA is to identify hazards contained within a facility or process and document how the hazards are being controlled. The DHA must be performed by a qualified individual or a team led by a qualified individual and all of the results of the DHA must be documented. For a given facility, a DHA will include a general overview the entire facility where an explosion hazard exists followed by an evaluation of the material(s) handled, process(es) where combustible dust is present, and buildings or building compartments where combustible dust is present. The requirement for DHA applies not only to new processes or facility upgrades; but it applies retroactively to existing processes as well. Specifically, NFPA 652 7.1.1.2. states that “for existing processes and facility compartments, a DHA shall be completed by September 7, 2020.” Also, in the next section NFPA 652 7.1.1.3 that "the owner/operator shall demonstrate reasonable progress each year in completing DHAs prior to the deadline set in 7.1.1.2." This means that as of September 7, 2020 all facilities that process or generate combustible dust must have a documented DHA on file or they will be at risk of penalties from the AHJ. If your facility needs to have a DHA completed for a new or existing process generating combustible dust, send an e-mail to sdceng@scientificdust.com and one of our qualified engineers will be able to lead or assist on a DHA for your facility.